262 Beacon is located on the north side of Beacon, between Dartmouth and Exeter, with 258-260 Beacon to the east and 264 Beacon to the west. 262 Beacon was built ca. 1872, one of two contiguous houses (262-264 Beacon) built for Nathaniel Hooper, a dry goods commission merchant and former shipping merchant in the East India trade. Click here for an index to the deeds for 262 Beacon. 262 Beacon was built on the eastern 19 feet of the 100 foot parcel and 264 Beacon was built next to it on a 41 foot lot. The western 40 feet remained vacant until October of 1885 when the trust sold it to Francis and Eliza Skinner, who built 266 Beacon built as their home. 262 Beacon was not listed in the 1876-1880 Blue Books and Nathaniel Hooper probably kept it as an annex to his home at 264 Beacon. By the 1880-1881 winter season, 262 Beacon had been leased from Nathaniel Hooper’s trust by William Browne Kehew and his wife, Mary Morton (Kimball) Kehew. They had married in January of 1880, and 262 Beacon probably was their first home together. He previously had lived on Savin Hill in Dorchester. William Kehew was an oil manufacturer and dealer. Mary (Kimball) Kehew was active in numerous progressive causes in Boston and served as President of the Women’s Educational and Industrial Union from 1892 to 1913. They continued to live at 262 Beacon during the 1884-1885 winter season, but moved thereafter to 317 Beacon. 262 Beacon was not listed in the 1886 Blue Book. During the 1886-1887 winter season, 282 Beacon was the home of Lt. Colonel Theodore Ayrault Dodge. He previously had lived in Brookline. A widower, he had served in the Civil War, losing a leg at the Battle of Gettysburg. He subsequently became a military historian, authoring several books on the Civil War and a series of volumes on the “History of the Art of War.” By 1888, he was living in Brookline once again. On June 10, 1887, 262 Beacon was purchased from Nathaniel Hooper’s trust by Mary Louisa (Stanwood) Dorr, the wife of cotton broker Ellerton Lodge Dorr. They previously had lived at 112 Beacon. The Dorrs continued to live at 262 Beacon during the 1894-1895 season, but moved thereafter to The Tudor (northwest corner of Beacon and Joy). On September 19, 1895, 262 Beacon was purchased from Mary Dorr by Sarah Livermore (Abbott) Fay, the widow of William Pickering Fay. She previously had lived at 11 Exeter with her brother and sister-in-law, Samuel and Abby Frances (Woods) Abbott. Sarah Fay lived at 262 Beacon during the 1895-1896 winter season, but moved thereafter and by 1900 was living in Wellesley with her unmarried brothers: Fletcher Morton Abbott (a farm owner), Franklin Pierce Abbott (a retired lawyer), and Holker Welch Abbott (an artist). She continued to own 262 Beacon and lease it to others. During the 1896-1897 winter season, 262 Beacon was the home of Guy Norman, a stockbroker and his wife, Louisa (Palfrey) Norman. During the 1894-1895 winter session, they had lived at 236 Beacon. 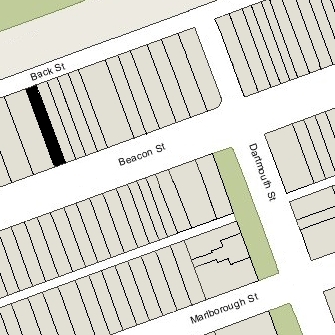 By 1897-1898 season, they had moved to 184 Marlborough. 262 Beacon was not listed in the 1898-1902 Blue Books. On June 4, 1902, 262 Beacon was purchased from Sarah Fay by Capt. William Francis Humphrey and his wife, Ellen Lizette (Gilbert) Fowler Humphrey. A June 5, 1902, Boston Globe article on the transaction noted that he bought the property for investment (that is, did not immediately plan to occupy it), and that as part of the consideration, he transferred a lot at 127 Bay State Road to Mrs. Fay. The Humphreys lived on Aspinwall Avenue in Brookline. William Humphrey was president of the Boston Towboat Company and one of the first maritime experts to opine that the sinking of the USS Maine in Cuba was due to an internal explosion and not a hostile attack. By the 1902-1903 winter season, 262 Beacon was the home of retired wool broker John Hurd Hutchins and his wife, Olivia Lee (Endicott) Hutchins. They previously had lived at 222 Beacon. They continued to live at 262 Beacon during the 1909-1910 winter season, but moved thereafter to 131 Beacon. By the 1910-1911 winter season, William and Ellen Humphrey had made 262 Beacon their home. He died in January of 1924. Ellen Humphrey continued to live at 262 Beacon, joined by her unmarried nephew, Henry Gilbert Frost, the son of Henry and Elizabeth Burrows (Gilbert) Frost. Ellen Humphrey died in November of 1930. Henry Gilbert Frost continued to live at 262 Beacon until about 1933 and also maintained a home in Hillsboro, New Hampshire. 262 Beacon was inherited by the Humphreys’ two children, Celia Campbell (Humphrey) Kemble, the wife of Parker Henry Kemble, and Campbell Humphrey. Celia Kemble’s interest was held by a trust established by Ellen Humphrey’s will. Celia (Humphrey) Kemble died in February of 1931, and on April 9, 1931, Parker Kemble purchased Campbell Humphrey’s interest in 262 Beacon. Parker Kemble was a naval architect and consulting electrical engineer; he lived in Marblehead. On April 29, 1935, real estate dealer Henry C. Brookings acquired Parker Kemble’s one-half interest in 262 Beacon, and on May 25, 1935, he acquired the other one-half interest from the trust established under Ellen Humphrey’s will. On May 21, 1936, the Supreme Lodge New England Order of Protection foreclosed on its mortgage to Henry Brookings and took possession of the property. On October 5, 1936, 262 Beacon was acquired from the New England Order of Protection by Mary Belin (du Pont) Faulkner, the wife of Dr. James Morison Faulkner. They lived in Brookline. He was a physician and later dean of the Boston University School of Medicine, and maintained his office at 264 Beacon. In November of 1936, James Faulkner filed for (and subsequently received) permission to convert the property from a single-family dwelling into doctors’ offices. In February of 1937, he filed for (and subsequently received) permission to amend his permit application and significantly alter the building. 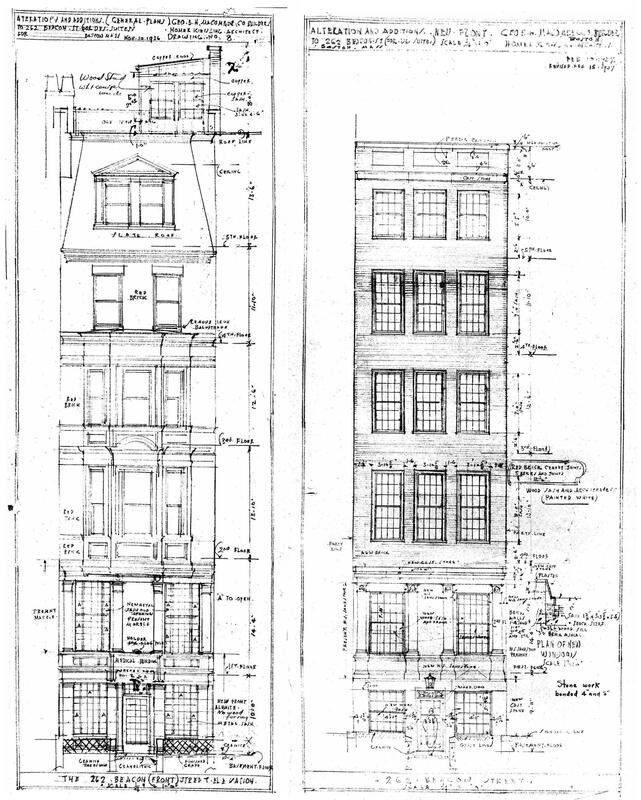 He received permission to “remove present wood bay on front at second and third stories; remove and rearrange windows in brick wall fourth floor; remove wood mansard roof at fifth floor and construct new brick front from second floor to roof.” The “changes at basement and first floor [were] covered by previous permit.” The remodeling was designed by architect Homer Kiessling. Plans for the original and revised remodeling — including elevations, floor plans, and framing plans — are included in the City of Boston Blueprints Collection in the Boston Public Library’s Arts Department (reference BIN P-142). 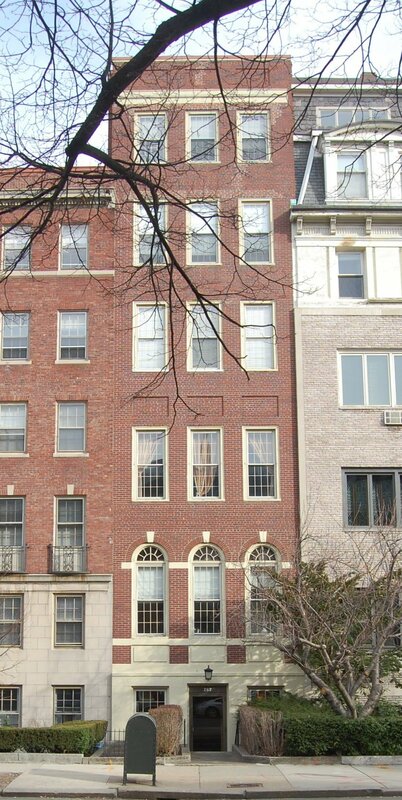 On March 1, 1937, Mary Faulkner transferred the property to 262 Beacon Street, Inc., of which James Faulkner was the president. The property remained medical offices and, on October 31, 1961, 262 Beacon Street, Inc., transferred the property back to Mary Faulkner. That same day, 262 Beacon was acquired by M. Leonard Lewis, president of the Lordonie Realty Corporation, owner of 264 Beacon. In April of 1972, he acquired 266 Beacon. On June 21, 1988, M. Leonard Lewis transferred 262 Beacon to himself and his daughter, Barbara Lewis Rubin, as trustees of the 262 Beacon Street Trust. 262 Beacon remained medical offices in 2016.